When we redid our kitchen about a year ago, we decided to leave a couple of the cabinet doors off by the kitchen sink for open shelves. I took a $6 piece of beadboard and painted it an aqua color and then put it behind the open shelves. 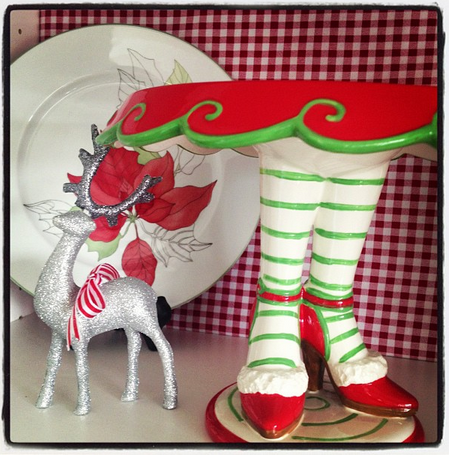 It has become one of my favorite places to displace seasonal and holiday dishes and decorations! And it’s so easy to change the space up every few months. Lately I have been loving Navy and Yellow. I think the colors together are perfect for SPRING. And kind of nautical – which I love! So the other day I took the beadboard out and spray painted it navy. Valspar has a reallypretty navy spraypaint — it’s called Indigo. And for less than $3 I changed up the beadboard background. 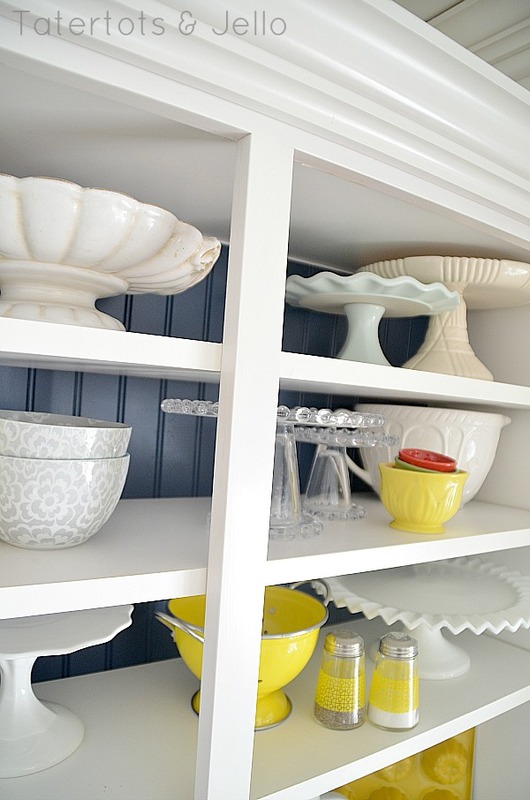 Once the beadboard was dry, I put the shelves back in place and then added all of my white cake plates. 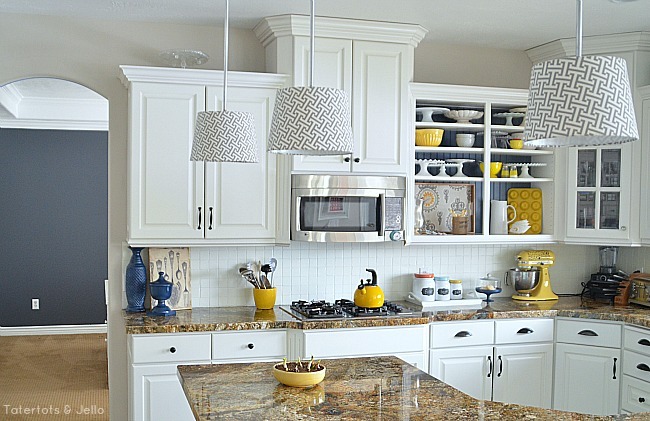 I scoured my kitchen and house and found all of the yellow accessories I could. 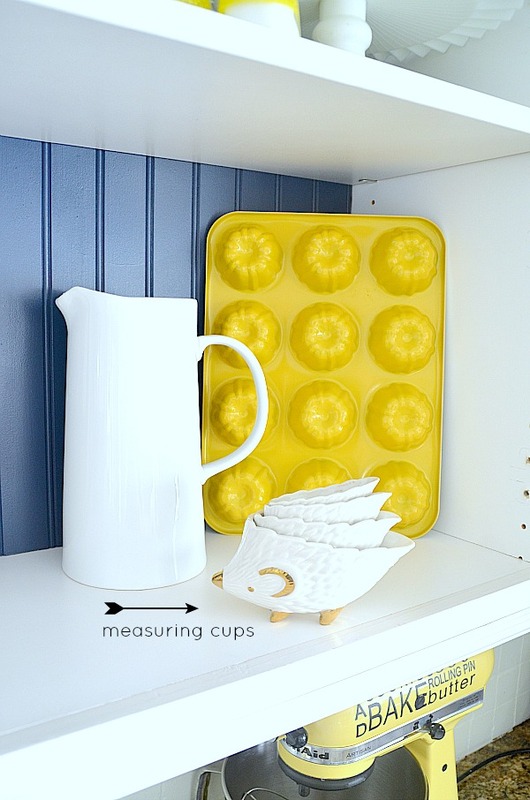 I also put these little hedgehog measuring cups in the nook – so I can use them in baking. I think they are so cute! 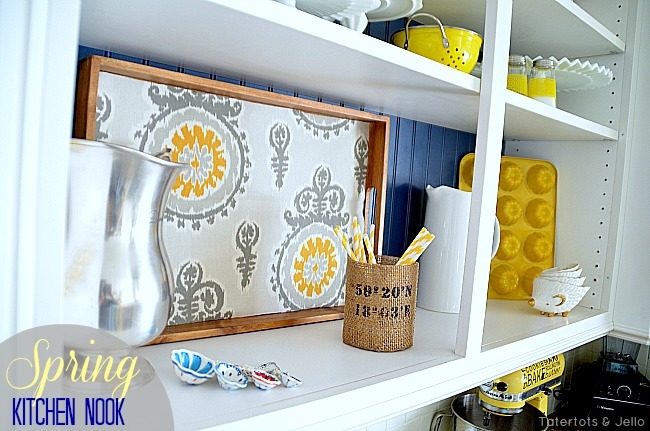 I also took a wooden tray from Target and lined it with some fabric I found the other day at Hobby Lobby. 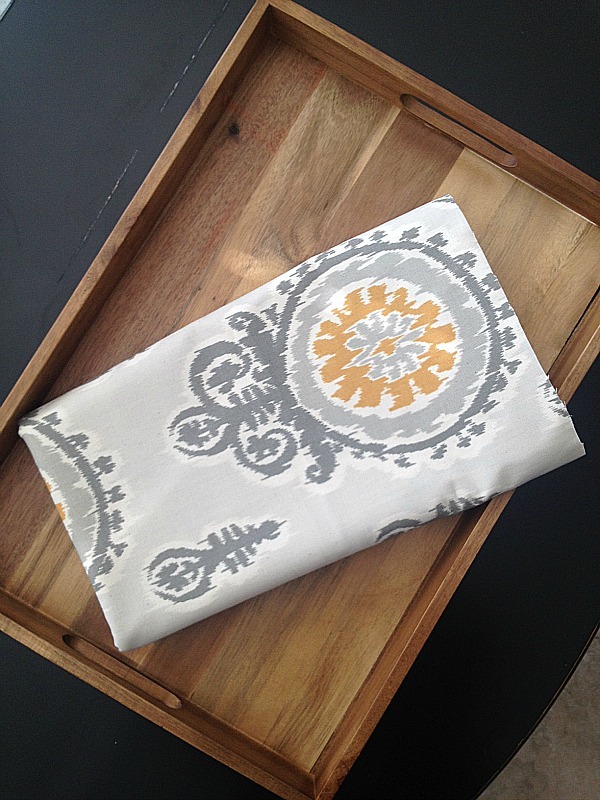 It’s a trendy grey and yellow Ikat. I cut the fabric and then used double-sided tape to attach the fabric onto the tray. I could also have mod podged the material for a more permanent solution. Another find was a burlap-wrapped glass vase from Hobby Lobby – it has a directional number stenciled on it which I love because it seems nautical. And it was 30% off and perfect for the space. I put some paper striped straws in the vase. So fun! I also display a few pretty pitchers in the shelves. It makes it really easy to grab things for a meal in a hurry. I spray painted a few finials and displayed them on the counter too. I love the new update for my kitchen. And I think it looks so pretty along with my the new grey/navy color I just painted my office/craft room in the next room. I kind of want to paint my whole house navy right now. 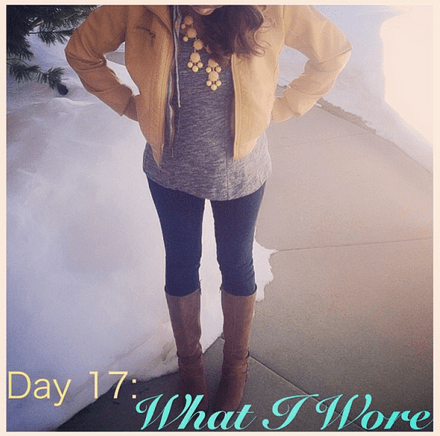 I’ve even been dressing in yellow and navy – haha! Do you have a space in your home that you love to change up for the seasons? Let me know in the comments – I would love to hear YOUR ideas!! Five-Ingredient Chocolate Lava Cake Recipe! I’m getting ready to do my study in navy and yellow. Love it! Oh I want your yellow Kitchenaid. My whole house is yellow and blue. Love it! I love that new look – you have such a great eye for things! 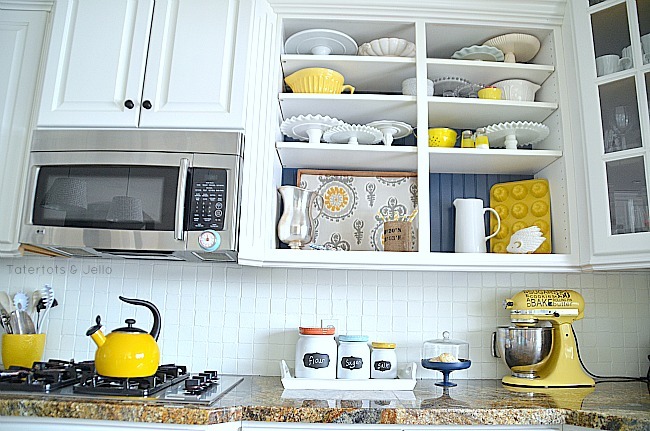 We’re planning a kitchen redo and I’m now seriously thinking about having some open shelving. Normally I don’t like the look but I really love yours (and have some milk glass and depression era pieces from all my grandmothers that I would love to display). thank you! I love the navy and yellow, and the idea of being able to swap things out so easily! I am needing to make some “cupcake stands” out of glass plates and thick crystal. Which type of paint is best to use? I looked at your blog but didn’t seem to locate a tutorial. What a beautiful kitchen! I am in the process of painting my cabinets, what color of white are your cabinets? I love the color! What an amazing kitchen you have created! Did you paint the tiles on the back splash? If so, what did you use? Yes, we painted the tile backsplash. It was a Tuscan brown tile and all we did was painted a couple of coats of primer that’s made for tile over the top of the backsplash and then two coats of the same paint that we painted the cabinets with. It was super easy. If you go to the hardware store just ask for primer that’s made to use with tile. Jen, you did an amazing job with your kitchen. I love the color combination (yellow and navy). Everything is in perfect balance, not to mention the amazing details. You did great job! Congrats! I look forward for your next DIY home project. If you ever want to change your countertops or kitchen tiles I recommend you to use Bondera Tile MatSet (www.bonderatilematset.com). Thanks girls!! Aren’t those hedgehogs so cute?? I just love them so much!! Thanks Angie!! I really love that combination and I think it really is a very classic combination. Thanks for the sweet comment!! wow, it looks amazing. I love how you can change it up so easily. That is exactly what I want to do with my spaces. Neutrals, whites and all the little cutie stuff to make it pop! Thanks for the inspiration. I agree!! Yes, neutral is so easy to change up with pops of color. I kind of want to paint my whole house white. It’s so clean and fresh looking!! so cute & refreshing to see that color combo!!! Jen, my dear where do you find the time? you are amazing!!! p.s. i’m so excited i get to see you in a couple of months at SNAP!!! Thanks my cute friend!!! I am SO excited to see you tooooo!!! If so is there a tutorial listed? Thanks so much!! Looks amazing!! I bought those canisters at Target! But you could totally make some like that. All you need to do is get some Silhouette Chalkboard vinyl and cut it out into that type of shape, then stick it on some canisters 🙂 You could even paint the canister lids the same color as the ones from Target. Love this! We just bought our first home and I am so excited to finish decorating all the rooms. Seeing this makes me think I’m not too crazy wanting great bursts of yellow everywhere, thanks! Yay!! I am so excited for you Rachel!! You are going to have so much fun decorating your new home!! LOVE!!! And those measuring cups?!?! WHAT!! So cool. LOL – aren’t those just the cutest things?? I kind of love them. I hope things are going well for you Mimi!! Love you!! Very fresh and I love how you decked it out for Halloween! Thanks Christy!!!! 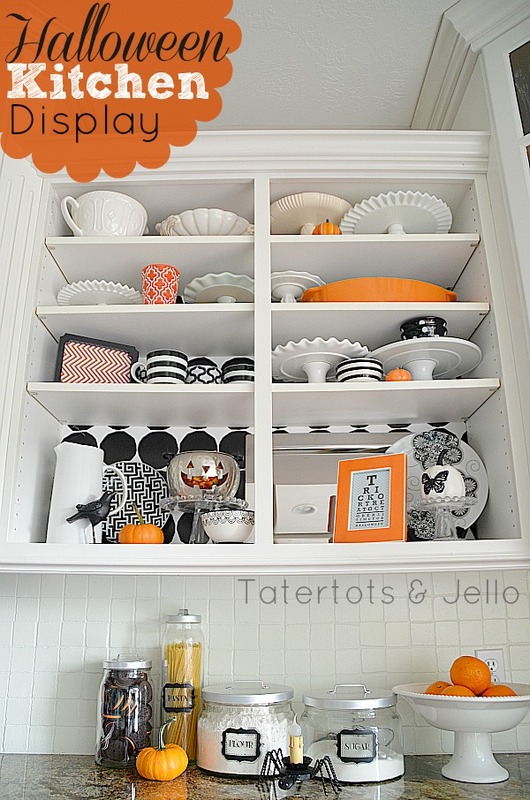 It is so fun having a little space to display seasonal dishes and little decorations. I am really loving it!! Your wet bar is so cute. I love the pennant you put up and the hot chocolate station. So fun!!! I love those colors! They really are restful together. Who doesn’t want to create a restful space? Thanks Lisa!! It really is such a fun space to change up for different occassions. Thanks for stopping by — I really appreciate it so much!! 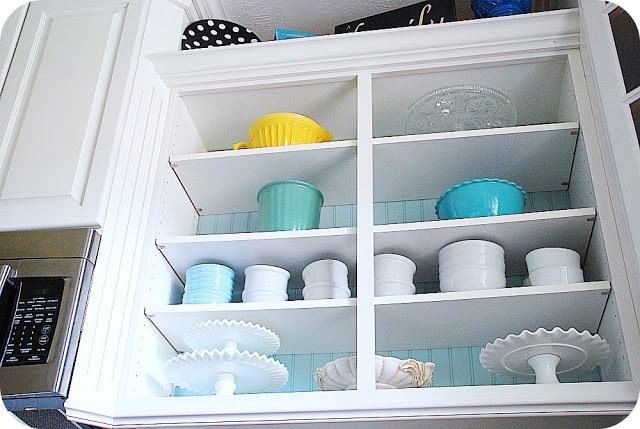 I cannot wait to paint my kitchen cupboards this summer. I am trying to convince my husband to do open shelving and he is having none of it. I mean look at how nice yours is, how can it not look good!? I’m totally loving navy right now too! I just bought a navy and white graphic print slipper chair that is sitting in my office and am so drawn to that color! 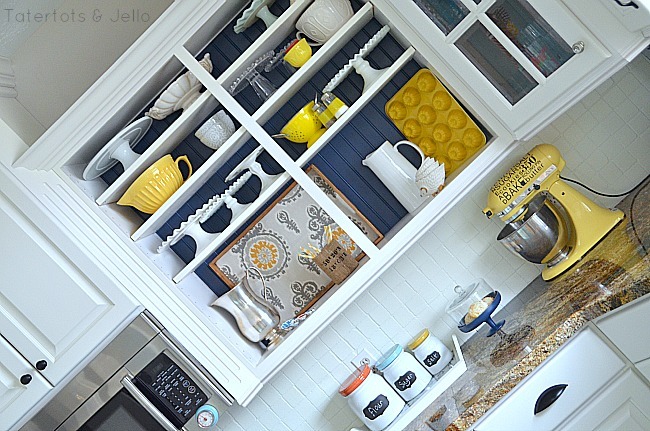 I love the navy and yellow and how it works with your kitchen and the rear wall – like it’s just meant to be there! Ohhh – your slipper chair sounds so pretty!!! I am just so in love with navy right now. It’s so timeless and such a great alternative to black or grey. Thanks for the sweet comment Jenny!! Those porcupine measuring cups – I’m dying. So cute. Haha I totally meant hedgehog… don’t know why I typed out porcupine. Yay!! You will love it. Will you send me a picture when you do it? I would love to see!! OH my gosh! Gorgeous! I love love love love it!! I LOVE the updates. Those hedgehog measuring cups are so cute, and wow…got cake stands? It’s so funny how you end up dressing like your home decor…I keep finding myself in white and either beachy blue or aqua! Thanks Jessica. I might have an obsession with cake stands. Isn’t it funny how we dress like our homes?? I love beachy blue and aqua!! Those hedgehog measuring cups are the cutest! Where oh where did you find them?? looks great! Ive always been a fan of navy….wear it a lot. Love those hedgehog measuring cups…where did you find those? Very nice. I have to ask – where did you find the Hedgehog measuring cups? They are adorable! Ps-shared this on My craft Channel’s fb page! Love you!! Tausha – you are the sweetest!! Thank you so much for the comment and also sharing. You are so so nice. You know that I love you and I think that you are fabulous right? Of course you do! Well done my friend…well done! So wish that I had the space to totally copy you! 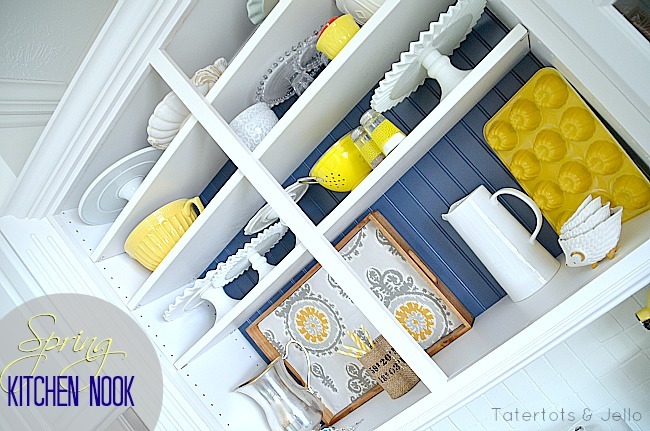 I love the yellow and navy combo and I’m a sucker for anything nautical! 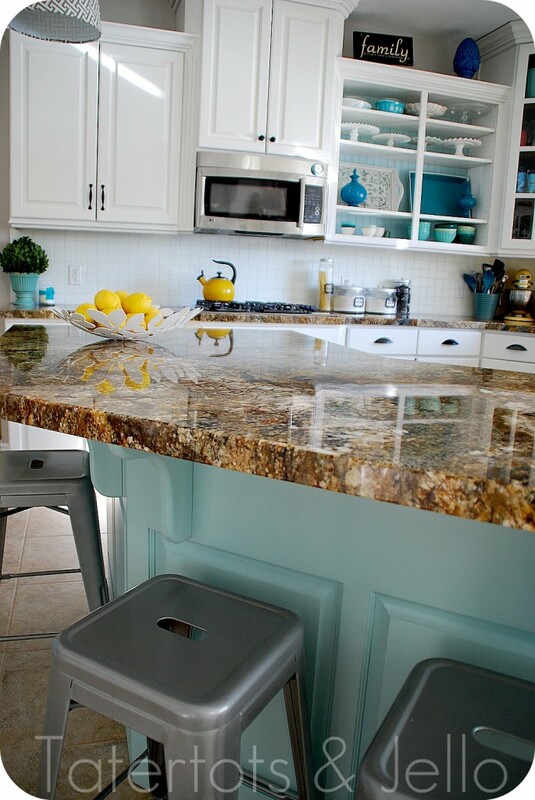 Your kitchen looks LOVELY with the new colors for spring! I just finished painting the back of my shelves navy as well. I’m loving it too! So fun!! Do you have a picture of your shelves? I would love to see them!! Adorable! 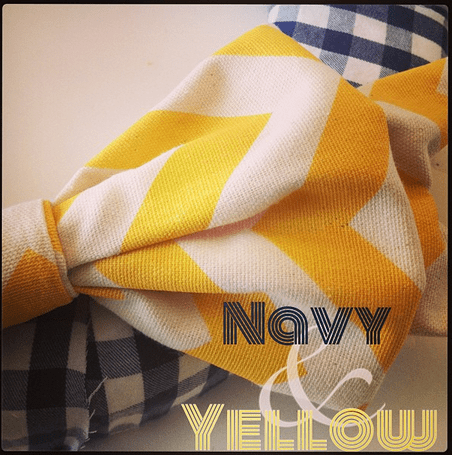 I LOVE the navy and yellow together–what a lovely pop that just makes you happy to look at! Can I ask where you got the decal that is on your Kitchen-Aid mixer? I just love it! Love it! Especially those hedgehog measuring cups. Too cute. I’m loving yellow right now, too. Isn’t yellow so happy? Yay. I can’t wait for Spring!! Thanks for the sweet comment Jenna!! Have a great day!! Thanks Laura!! I think I am a little obsessed with the combination. Yellow is such a happy color. Thanks for stopping by!! I love the navy and blue. I also LOVE your granite counters. What is the name of it? It’s beautiful. Wow! I love your yellow and navy color combo. You are so talented, Jen! Doreen! Thanks so much. You are so sweet!! Yes Iove it too. The navy blue and yellow fit together. I love how the color yellow pop.